Walt Jabsco and the 2 Tone logo. A sub-genre of ska that showed up in Britain at the end of The '70s. 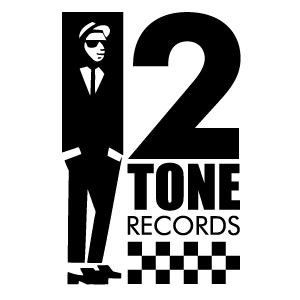 2 Tone took its name from a newly formed record label based in Coventry, recognised by its distinctive checkerboard logo and mod mascot "Walt Jabsco". Since the company gave bands the option to produce one single with no obligations to follow it up, several successful ska groups were able to record a 2 Tone release before moving on to another company if they wished. Musically, the second wave bands were influenced by Reggae, Punk Rock and the northern soul dance scene, all of which were very popular in the British independent scene during the 1970s, as well as first wave ska imported from Jamaica and distributed by the Blue Beat label, resulting in a sound faster and harder-edged than Jamaican ska. Notably, a lot of songs were "interpretations" or covers of old or obscure ska and reggae tracks by Jamaican artsts. Many of the songs released by second wave bands were politically and socially conscious. Most of the main groups had multiracial line-ups, with songwriter Jerry Dammers - probably the dominant personality behind the formation of the 2 Tone Records label and the keyboard player for The Specials - stating that one of his aims was to use music to oppose racism and preventing the growth of groups like the National Front in the mod/skinhead revival occurring in the late-1970s. Furthermore, many lyrics were also critical of Conservative PM Margaret Thatcher, most famously the Specials number one hit Ghost Town, which blamed the government for the unemployment and inner city decay of the early 1980s. Although some American ska groups such as The Toasters and The Mighty Mighty Bosstones - who were influenced by the performers in the British scene - also appeared around this time, they're generally not counted as 2 Tone bands. Rather, they are usually categorised as major influences of the American Ska Punk, or Third Wave ska genre; the American ska scene was arguably kicked off by British expatriate Robert Hingley, whose band (the Toasters) were formed when he discovered that there were no major exponents of ska in the states. As a tribute to their British influences, the Toasters subsequently recorded a song called "2 Tone Army" (which saw use as the theme for a cartoon show in the 1990s).